This article covers the hr interview questions and answers for fresher and hr interview introduction. This is explained in article that how to prepare for a job interview. Some important tips to be remember on interview day also explained in this article. What is HR Interview ? How to prepare for a job interview ? Recruitment process of any organization have several rounds such as written test, group discussion, technical interview followed by HR interview . HR Interview plays an important role in the selection. HR interview is a process during which interviewer judge your strengths, weakness, your body language, your communication skills, your background and your overall personality traits to understand that whether you are suitable for the job profile. Some tips for hr interview questions and answers for fresher have been explained in this article. Technical skills are not sufficient for any job. You should have good communication skills . You should know how to behave with colleague. How to interact with clients etc. So HR interview is a process of checking your personality traits. While preparing for HR interview, it is suggested to you to make an efficient plan which comes out to be helpful to achieve your goal. 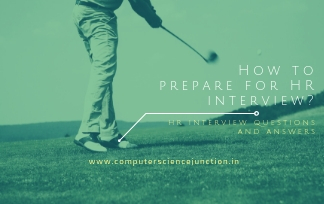 I am telling about some tips that you should keep in mind for preparing the HR Interview. At first you need to understand the Job position you are applying for. You need to collect the information useful for that job such as what skills , eligibility criteria, qualification, nature of job etc. Once you collected all information then now Match the requirement of the job profile to your resume. Note down there matching points. These points will help you justify the interviewer that you are suitable for that job.If during the interview you are able to justify this then it will increase your chance of selection. Prepare yourself to answer any possible question the basis of your resume. Next important tasks that you should do before going to hr interview is that you should do the research about the company such as services provided by the company, turnover of the company, who is CEO of the company, number of employee working in the company, company clients and countries in which company is operating business. In the last be mentally prepare for the interview by asking the questions. Reach Venue on time. day of interview you should follow these points strictly. Be honest with your resume don’t try to fake. Don’t give any irrelevant answer. Dressed up properly. Wear formal shirt and pent and black shoes. Keep extra Resume and photocopies of the documents. Identity card. If you are a college student of final year then go in college dress for interview and keep your college id card with you. Be interactive with HR and give the answer with a smile. 1. Introduce Yourself or Tell me about yourself. This is the first question to be asked in any type of interview either it is technical or hr interview. If you are a fresher then you have to answer this question in short. In the answer of this questions you have to tell about your name, residence city,your qualification with percentage and university/institute name and your strengths . If you have working experience then you have to also tell about that. 2. Why do you want to join our company ? This is another one of the most important question. You should do a research about the company information to answer this question. You should tell about achievement of the company , working environment , positive aspects of the company while answering this question. 3. Why should I hired you ? While answer this question you should tell about how you are suitable with their job profile? You have to tell about how your technical skills are matched with the job profile. 4. What are your weakness ? 5. What are yours strengths? The best way to answer this questions is that tell about your those strengths which motivates you to move ahead and positive traits of your personality. Be ready to justify your strength with an example you have faced in you life.